This sort of thing that the Liberal Democrats pioneered. 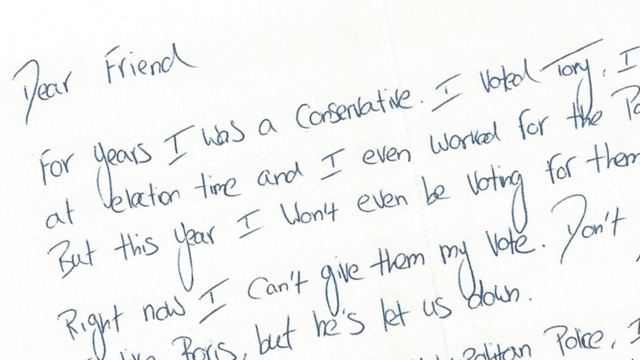 A ‘hand-written’ letter to try and persuade you of the merits of their candidate. It’s meant to be more personal than a traditional leaflet and, therefore, have more impact. I got this delivered by Royal Mail this afternoon. Except this doesn’t even mention Ken. Instead, it attacks Boris, purporting to be from a former Conservative activist. The only way you’d know it was from Ken is by reading the small imprint where it reveals it’s from the Labour Party. A desperate, desperate measure. Don’t mention Ken, just attack Boris in the hope it depresses his vote a little. No wonder the bookies are already paying out on a Boris victory. So glad you have mentioned this as I got one yesterday as well. It truly enraged me as it was so painfully and ineptly manipulative. I am curious where they got my details and voting intention from as no one else in my house received one. I wondered that. Given my politics and address are both fairly public I assumed it was targeted at Conservatives, but a fairly underhand leaflet: if not surprising they didn’t have anything positive to say about Ken.